A Painting and Drying Spraybooth is the place in which the vehicle is painted via a spray gun with air channel working under the low pressure and followed by drying. Air derived outside of the facility through the ceiling filter system. Paint particules holded by paint stop filters and decomposed from air. 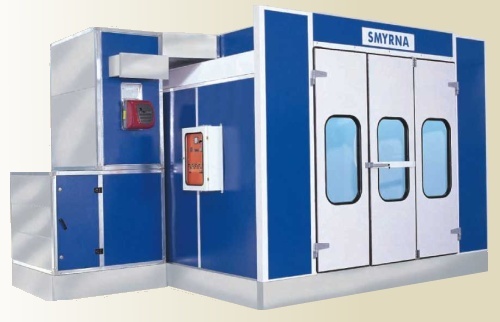 Spray booth is equiped with diesel burner and fan-motor units. In front of the booth entrance, beside the entrance ramp, a metal basement or excavation work, a channel connection to units for air circulation is executed and installed on the facility floor. Side walls are made of galvanized sheet of 1 mm, with 40 mm glasswool insulation. In order to provide an ergonomic view and longer life, outside surface of the panels are painted with import static powder paint. Our products have the illumination system which had been designed in order to optimise the color control during the painting phase. In the spray booth, exists a hanger system with rails hanged up to the ceiling, which enables parts painting beside the automobile. Ceiling; is the section which provides the homogeneous flow of the air coming from heat exchanger, through the plenum and filters. Ceiling consists of sheet panels with special insulation support and in order to clean the air supplied to the booth, filter item made of non-flammable material, special high performance, long life is placed under the ceiling. 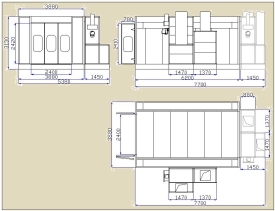 There are 3 doors in fron and at the back of the booth, and 1 door system for personel entry and exit. Door items have observation windows made of safety glasses. Thickness of the doors is 55 mm and insulated with 55 mm glasswool. All Windows include glasses. This unit supplies the filtered fresh air into the booth and throws the used air to outside during the painting. On the other hand, during drying it heats the air up to 60 °C and supplies into the booth, mix used air with fresh air in proportion of 10% (through the multi damper) and circulates it after re-heating. Heating of air is provided by a diesel burner having a capacity of 150.000 kcal/h and an exchanger made of stainless steel sheet having 304 quality. First start up and rising the air temperature up to 60 °C takes aproximately 15 minutes, depending on outside weather conditions. Delivery of the heated or not heated air into the booth or circulation of it is provided by two industrial type fans, each having the capacity of 18.000 m³ / h. In this unit air is delivered to the booth after filtered by a pre-filter. Additionally output air is controlled by a damper in the output air channel. Panel in which the motors and devices in the enclosure of the proposal are operated and controlled from a central point in order to provide them to fulfill their functions. Panel is made of GALVANIZED sheet and steel profiles, which are bump resistant, completely covered, water proof and damp proof. Panel shall include all switches and fuses necessary for motors and electrical devices, where appropriate signal lamps, thermic relay, contactor and clemences. Command and control connections from electric panel to motors and other electrical devices shall be done with heatproof cables. Electric lines shall be placed on a basis so that formation and replacement is easy.